Atlantis Eyecare invites you to attend a FREE innovative and educational seminar to learn about the latest advances in cataract surgery. Dr. Ehsan Sadri will be giving you all the information you need to understand the process and your options. 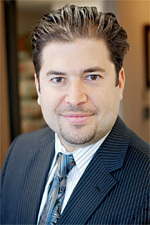 After the seminar, Dr. Sadri will be doing a free evaluation on those ready to schedule surgery. We encourage you to bring a loved one that can help you understand your options and make a decision to move forward with surgery. The locations of the seminars rotate between a few of our offices to better accommodate everybody. Any specific notes or questions? Dr. Ehsan Sadri is a national speaker who travels often to speak at conferences about the new advances in cataract surgery. Additionally, he actively participates in teaching new surgeons the latest techniques in cataract surgery. Dr. Sadri was identified as one of the leading innovators in the field of premium IOL surgery by Premier Surgeon Magazine and also has numerous published articles on the subject of advances of cataract surgery. In addition, Vitals.com recognized has awarded Dr. Sadri with their Patients Choice Award and Compassionate Physician Award from 2008-2010. Dr. Sadri is fluent in Spanish and Farsi.